Bajrangi Bhaijaan is a popular topic getting discussed over India & set to hit the screens tomorrow (July 17, 2015). The movie will be released in over 50 countries on 5300+ screens (4500 in India & 800+ overseas screens). Now, we hear that the film has also approved by Pakistani censor board & will be released this friday across the boarder in Pakistan. 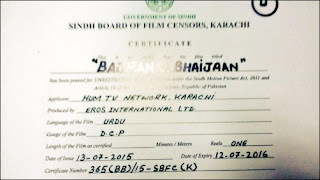 In fact, Fakhr-E-Alam, new chairman of Pakistani Censor board has posted the image of certificate on his twitter saying "Previewed & certified Bajrangi Bhai jaan & for the record it is not a negative or anti Pakistan film." It's a great news for Salman's fans! Singer-turned-Businessman, and now, the new chairman of the Pakistani Censor Board also added "Infact bajrangi bhai jaan is the most positive film for Pakistan that bollywood has produced in a long time. Totally unexpected." Bajrangi Bhaijaan is a story of a Hindu man, who is on a mission to take a deaf and mute little Pakistani girl back to her country. The film features Salman Khan, Kareena Kapoor Khan & Nawazuddin Siddiqui in lead roles.